Of course, it remains to be seen if machine dishwashing actually has a causal relationship with allergy, or if it is linked with some other important factor. 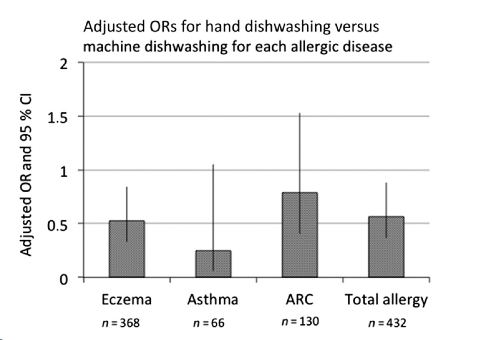 The authors speculated that hand dishwashing is associated with increased microbial exposure, which has been shown to be protective against allergic diseases. This has been called the hygiene hypothesis – see Weinstock and Elliott 2009 – and Brown et al. 2013 – an idea that has gathered substantial support and refinement as we learn about the role of the microbiome in shaping early immune development. It is less certain whether microbiome interventions can have a big impact on outcomes in adults. Given the burden of allergic and autoimmune diseases, it makes sense that we should be interested in preventing and treating established disease. This might be best accomplished with diet, and perhaps with probiotics. We will explore these possibilities in Week 2 of the UNM Ev Med Elective. It’s great news that you’ve been able to get an evolutionary medicine elective into the medical school curriculum! And the hygiene hypothesis is a worthy topic. As you note, it has helped us to make sense of, and potentially prevent and treat, several allergic and autoimmune conditions, which is a feather in the cap of evolutionary medicine. I would like to point out, however, that microbiome disruption probably is not the most important reason for the soaring prevalence of childhood food allergies. In the past 20-25 years, they are up by 50% overall, and they are up by a remarkable 300% in the case of peanuts (US data). One problem for the hygiene hypothesis (as an explanation for this increase) has to do with timing. Farm-to-city migration, widespread use of antibiotics, and our changing diets—which are thought by many to be the most important sources of microbiome disruption (and throw in automatic dishwashers)—all predate the increase in childhood food allergies by many decades. While it’s possible that a threshold in disruption sufficient to increase food allergies was only reached in the past 20 or so years, that case has not yet been made. In any event, the hygiene hypothesis has a bigger problem. It can’t explain why childhood food allergies are dramatically reduced by early exposure to allergenic foods. For instance, by eating peanuts while pregnant and breastfeeding, peanut antigen is transferred to the fetus/infant, and the risk of developing a peanut allergy drops dramatically compared to the child of a mother who avoids peanuts while pregnant and nursing. And both children presumably have similarly disrupted microbiomes. Here’s the relevant quote from my article. Dr. Alcock, you are providing a great service to our medical society by introducing this type of information into their curriculum. We need more of this type of training. Also, Paul’s explanation is very close to what we observe in swine nutrition and production. We-swine nutritionists and diet formulators-have known for at least 20 years that the timing of exposure of soybean meal for baby pigs before weaning is very important for their subsequent health and performance. In general baby pigs are taken from their mothers at about three weeks of age and it is known that they need a certain quantity of soybean meal consumed before they are weaned to ensure that they respond to normal levels of soybean meal in their diets as they grow and develop. Pigs weaned without adequate intake of soybean meal before weaning never perform at optimal levels later in life. They experience more gastrointestinal problems during the weaning process and elevated levels of morbidity and mortality as they continue to grow. So, even though soybean meal is less digestible than other ingredients such as milk and whey, we add it to our creep diets for the improved later benefits. It is known that the process of introducing the offending ingredient at this early time in the life of the pig improves immune tolerance for the remainder of the pigs life. Fascinating. Thank you Fred. The notion that timing of nutrient introduction has life long effects on development and immune tolerance in particular has important implications for human health.